Retirement security is a growing, Canada-wide problem. Over 11 million Canadian workers are without workplace pension plans. Study after study shows that Canadian workers can’t afford to save enough for retirement. Unless things change, baby boomers and future generations are facing serious declines in living standards upon retirement. All Canadians deserve to retire with dignity. A gradual and modest expansion of the Canada Pension Plan (CPP) is the best way to ensure retirement security for Canadians. In 2016, the Liberal government expanded the CPP after repeated calls from Canada’s Labour Movement and years of the previous conservative government’s refusal to address the needs of workers. While the expansion falls short of Labour’s push to double the CPP to provide retirement security for every Canadian, it is a meaningful improvement. The CPP changes will see all workers earning more CPP benefits on a go-forward basis, funded by a small increase in worker and employer contributions to the plan. The current CPP aims to replace 25 per cent of a worker’s earnings up to the CPP ceiling (currently set at $54,900). The expanded CPP will see two main changes. First, the replacement rate will rise from 25 per cent to 33 per cent. Secondly, the CPP ceiling will increase by about 14 per cent. This means more earnings will be covered by CPP. The increase in contributions will be phased in over seven years beginning in 2019. Old Age Security is a part of the bedrock of Canada’s retirement income system. It is comprised of a flat, “basic” taxable pension that is nearly universal, as well as an income tested program targeting low income seniors (Guaranteed Income Supplement or GIS) and an additional income tested supplement for spouses (or survivors) of OAS recipients who are between age 60 and 64 (“the Allowance”). Taken together, these three elements are often referred to as “Old Age Security”, and they are all funded together out of federal government general revenues. Think you have a good deal with your RRSP? Think again. RRSPs and mutual funds have failed to deliver. Too many retirees are left with a goose egg instead of a nest egg. Abandoning defined benefit pension plans is short-sighted and irresponsible, and will do nothing to help Canadians prepare for retirement. The Canadian Union of Public Employees says faulty claims that defined benefit pensions are ‘unaffordable’ – like those made in a recent report from the Fraser Institute – are just a distraction from the real pension crisis. CUPE locals across the country are facing attacks on their pensions. Many plans are dealing with funding challenges, suffering from recession losses and historically low interest rates. Employers are pushing for serious cuts, or closing plans altogether. At a time when so many Canadians have little or no retirement savings, we can’t let the pensions we do have slip away. The Regina Civic Employees’ Pension Plan is in trouble. 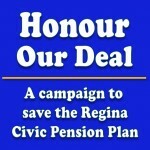 The City of Regina is refusing to implement the deal signed by all parties in May 2013 and increase its contributions as required. Saskatchewan’s pension regulator, meanwhile, is now considering cancelling the pension plan due to non-compliance with pension law. 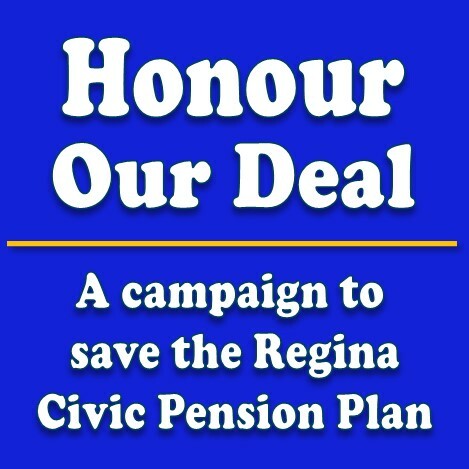 Workers and retirees are facing uncertainty about their retirement and have launched a campaign calling for the City of Regina and elected City Councillors to Honour our Deal.